Although Switzerland isn’t a member of the EU it enjoys close ties to the 28-nation bloc. Bern has painstakingly negotiated a series of bilateral agreements with Brussels, including one that allowed most of the EU’s 500 million citizens to live and work in Switzerland with little formality. Swiss citizens, in turn, could do the same in the European Union. Under Swiss law the government now has to renegotiate its treaty on the free movement of people, though it is still unclear what kind of caps will be placed on immigration, and when. Switzerland already introduced quotas for immigrants from eight central and eastern European nations two years ago. The latest decision is likely to have much more far-reaching consequences though, as hundreds of thousands of well-educated foreigners from Germany, France, Italy and other EU countries work in Switzerland. Ahead of Sunday’s referendum business groups warned that many of the 80,000 people who moved to Switzerland last year are vital for the country’s economy, and curtailing immigration further could cost Swiss citizens’ jobs too. The Swiss Bankers Association expressed disappointment at the vote. “We urgently need to hold constructive talks with the EU to explain our position,” it said. The EU said it regretted the outcome of the vote but would see how the government implements the mandate given to it by voters. 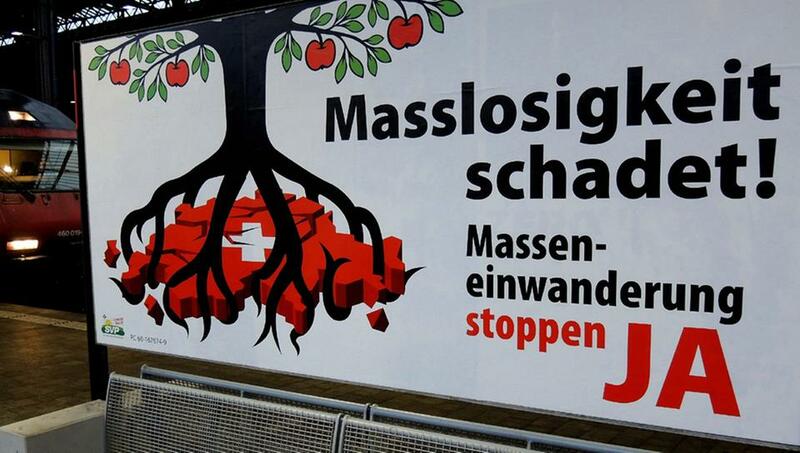 The text of the referendum gives the Swiss government some leeway to decide how many immigrants can come to Switzerland each year, and how to divide the quota between different groups. The text of the referendum also requires the government to introduce limits on foreigners’ rights to bring in family members or access Swiss social services, and curtail asylum — a move that could dent Switzerland’s humanitarian image. Sunday’s outcome is another success for the nationalist Swiss People’s Party, which has more than a quarter of seats in the lower house of Parliament. The party has won a series of referendums in recent years, including a surprise victory in 2009 when voters approved a plan to ban the construction of new minarets. 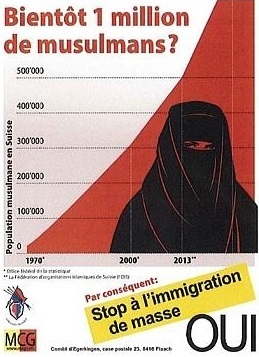 According to official figures about 500,000 people in the nation of 8 million identified themselves as Muslim. Many of them are former refugees who fled to Switzerland during the Balkan wars in the 1990s. Only a minority are actively religious. In a local referendum in the eastern municipality of Au-Heerbrugg, voters decided Sunday to impose a ban on Muslim girls wearing headscarves at a local primary school. This entry was posted in Right wing, Switzerland by Bob Pitt. Bookmark the permalink.